When you are living in a small space it is important to utilise every possible space, and the walls are often overlooked real estate. I hate clutter in the bathroom, but I also like to easily get to the things I use on a daily basis. Often in small bathrooms there are no drawers, which I hate, but this seems like a great solution to use the wall in your bathroom to be functional and pretty. Here is a kitchen that has made great use of their wall space. The hanging pots and the many sized shelves give it a cozy feel, while taking care of a lot of storage. Of course pegboard is always a great idea for a kitchen wall in a small space. 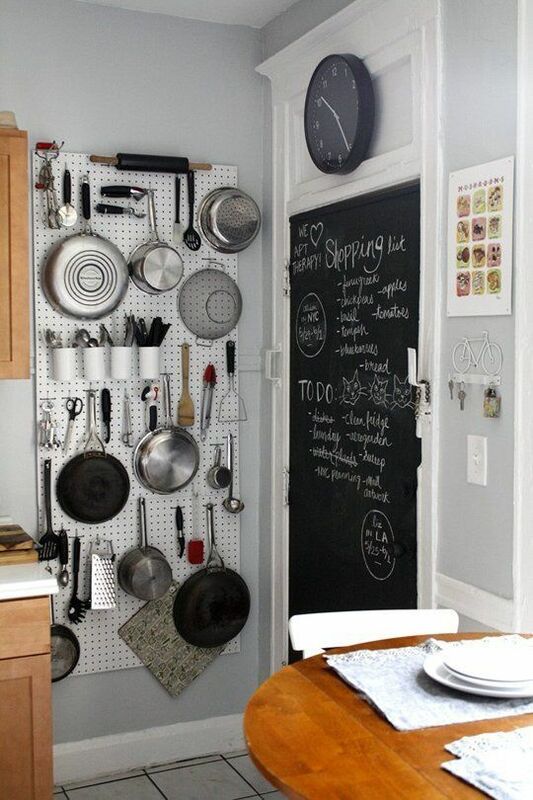 Hanging all of your kitchen utensils and pots is visually appealing as well as a great space saving idea. 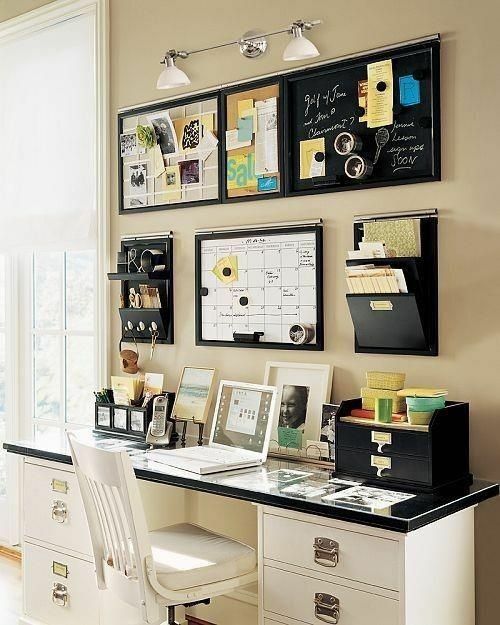 Most small spaces do not have a lot of room for a home office, but this is a great idea for organizing above your desk. We all have photo and other wall hangings that we want to display and a wall gallery is a wonderful design element. It can also be a way to help disguise that TV we all have. 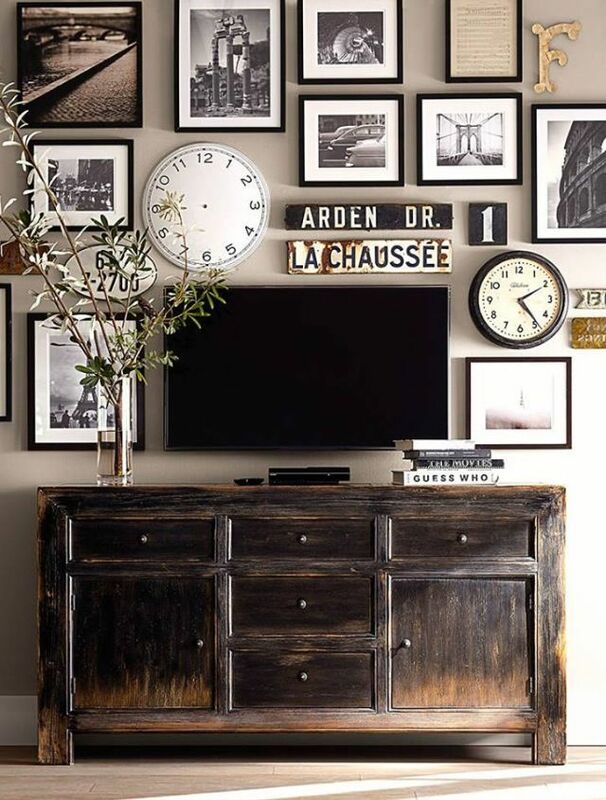 What are some of the ways that you utilize your walls to create more space? P.S. Find more small space living ideas here and on my small space living board on Pinterest here. I hate having to dig things out of cupboards in the bathroom. Happy with a new glass shelf, just the right size for what I use on a daily basis. Love these ideas. I have open shelves in my bathroom and I love it. I like your get organized for small spaces posts. 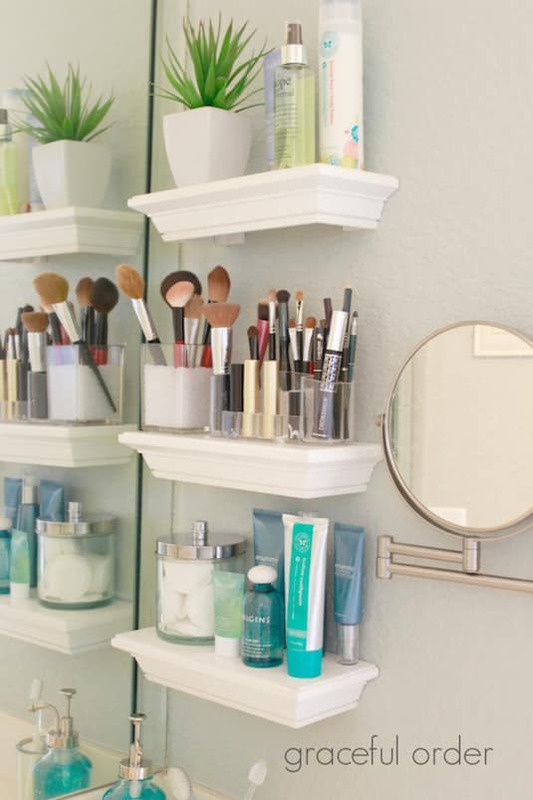 I have seen shelving in a bathroom similar to what you showed except is was just a glass shelf. It was interesting. It looked like the pretty cup and soap on it were almost floating in mid air! Love all these ideas Laura. My make up drawer is so messy but I like that I can shut it and not see all the mess. The makeup organized in the inspiration picture is awesome. Have a great week end. These are fun to look at! Being someone who was not blessed with much closet space in my home, I am constantly looking for ways to beat clutter and sadly I don't always win! I love the kitchen photo....decluttered, smart storage and still homey and spacious looking! Have a nice weekend Laura! I climb them when I am stressed out. There are some great ideas in your inspiration pictures: stylish and useful.